Sterling, VA (February 21, 2007) - Suhor Industries/SI Memorials, Overland Park, Kansas, has been awarded an Honorable Mention in the International Cemetery, Cremation and Funeral Association’s 2006 KIP (Keeping It Personal) Awards, recognizing the best in personalization in the cemetery, funeral service and cremation profession. Suhor Industries Chairman/CEO Joseph U. Suhor, III was honored in the Special Events category for joining forces with Hixon Funeral Homes and Johnson Funeral Home in Lake Charles Louisiana, in a year-long restoration of 38 cemeteries in Cameron Parish, Louisiana that were damaged by Hurricane Rita in September 2005. Suhor Industries and the two local funeral homes worked together to re-inter almost 300 recovered bodies and to restore the breached cemeteries. The year-long efforts ended with a dedication ceremony to honor the families of those affected by the storm and to pay tribute to those involved in the recovery process. Alan Chapman from Inquest Marketing in Overland Park, Kansas, helped the companies plan and promote the ceremony, which was held in October 2006 and included speakers, a choir, a shrimp boil, a time-capsule dedication and more. 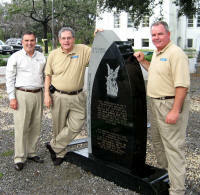 SI Memorials and the funeral homes donated a 5’ tall, two-tone India Black granite monument on an all-polished base commemorating the efforts of the community in its rebuilding process. They involved local area school children by inviting them to place stories, photos and small memorabilia into the time capsule, donated by SI Funeral Services and Wilbert Funerals Services, which was buried next to the monument. The ICCFA’s 2006 KIP Awards contest drew 23 entries from across North America. Five marketing and communications professionals from outside the cemetery, funeral service and cremation profession performed the judging. Judges were impressed with the efforts of Suhor Industries and the two local funeral homes to bring relief to a community in need. One commented, "A well-orchestrated event. Good participation from national and local dignitaries and the community. The choice and shrimp boil added fun to the solemn occasion for the rededication.” Another added, "Great effort in recovery – wow – lots of hard work. I like how the community and families worked together in a disastrous situation." "We were extremely pleased with the broad range and high quality of entries to the KIP Awards program this year," said Julie A. Burn, chair of the ICCFA’s Personalization Committee. "Staff at Suhor Industries and the two funeral homes demonstrate a strong commitment to personalization, to serving the community and to providing caring, meaningful services to families in their time of need. They are true leaders within our profession and deserving of this prestigious award." All KIP Awards recipients will be recognized at the ICCFA 2007 Convention, March 20-23, in Las Vegas, Nevada, and in ICCFA Magazine. Founded in 1987, the ICCFA is the only international trade association representing all segments of the cemetery, funeral, cremation and memorialization industry. Its membership is comprised of 7,200 cemeteries, funeral homes, memorial designers, crematories and related businesses worldwide.